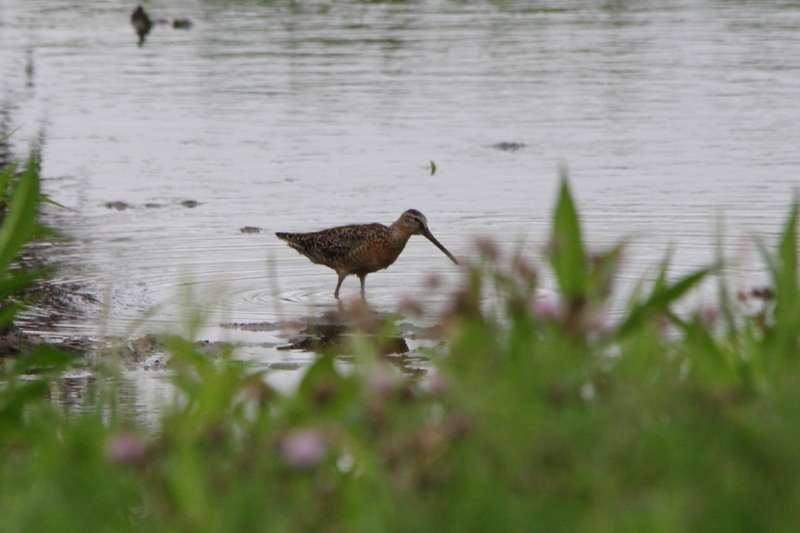 The Short-billed Dowitcher like its congener the Long-billed Dowitcher, is a medium-sized, stocky, long-billed shorebird in the family Scolopacidae. It is an inhabitant of North America, Central America, and northern South America. It is strongly migratory; it completely vacates in breeding areas during the snow-bound months. 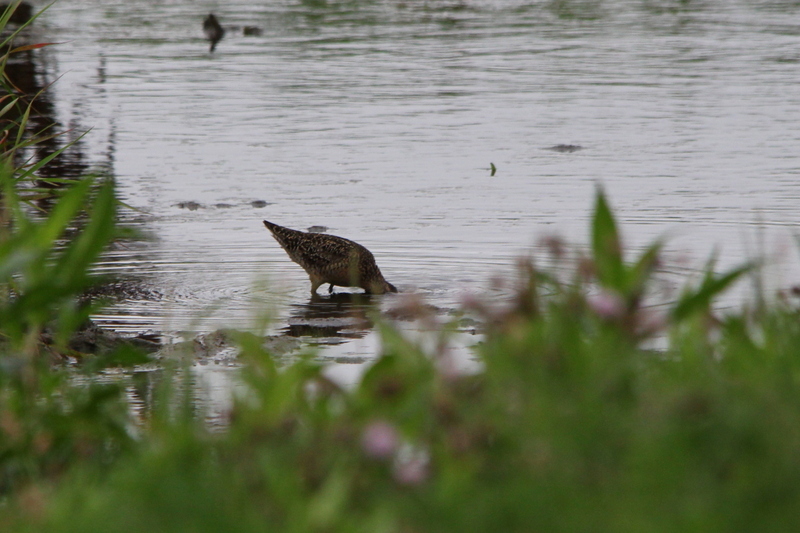 This species favors a variety of habitats including tundra in the north to ponds and mudflats in the south. It feeds on invertebrates often by rapidly probing its bill into mud in a sewing machine fashion. The body of adults is dark brown on top and reddish underneath. The tail has a black and white barred pattern. The legs are a yellowish color. The winter plumage is largely grey. This bird can range from 23 to 32 cm (9.1 to 13 in) in length, 46 to 56 cm (18 to 22 in) in wingspan and 73–155 g (2.6–5.5 oz) in body mass. 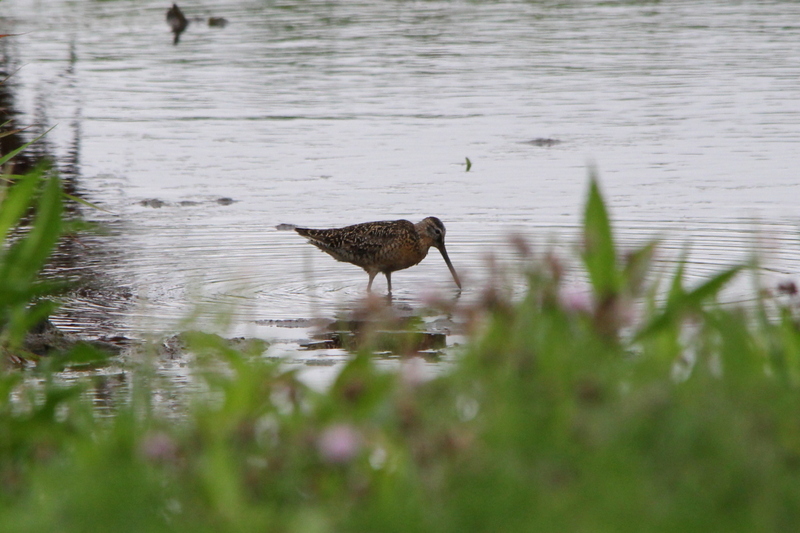 Their breeding habitat includes bogs, tidal marshes, mudflats or forest clearings south of the tree line in northern North America. These birds nest on the ground, usually near water. Their nests are shallow depressions in clumps of grass or moss, which are lined with fine grasses, twigs and leaves. They lay four, sometimes three, olive-buff to brown eggs. Incubation lasts for 21 days and is done by both sexes. The downy juvenile birds leave the nest soon after hatching. Parental roles are not well-known, but it is believed the female departs and leaves the male to tend the chicks, which find all their own food. 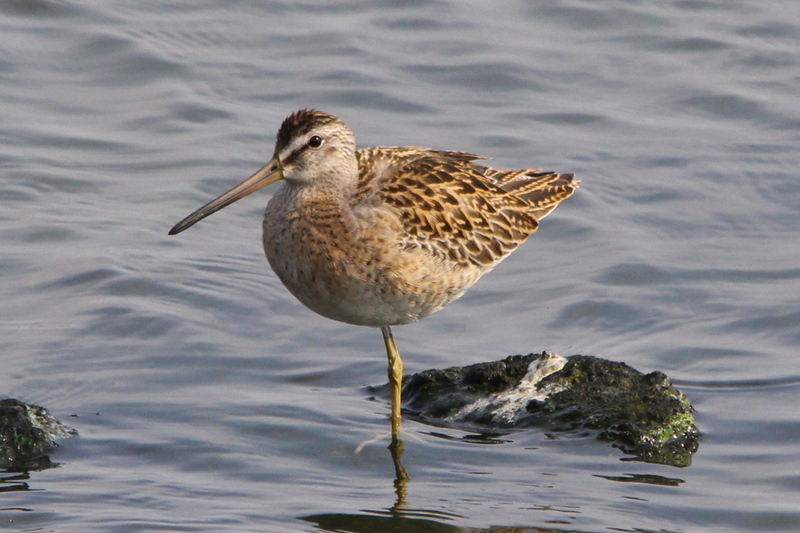 They migrate to the southern United States and as far south as Brazil. 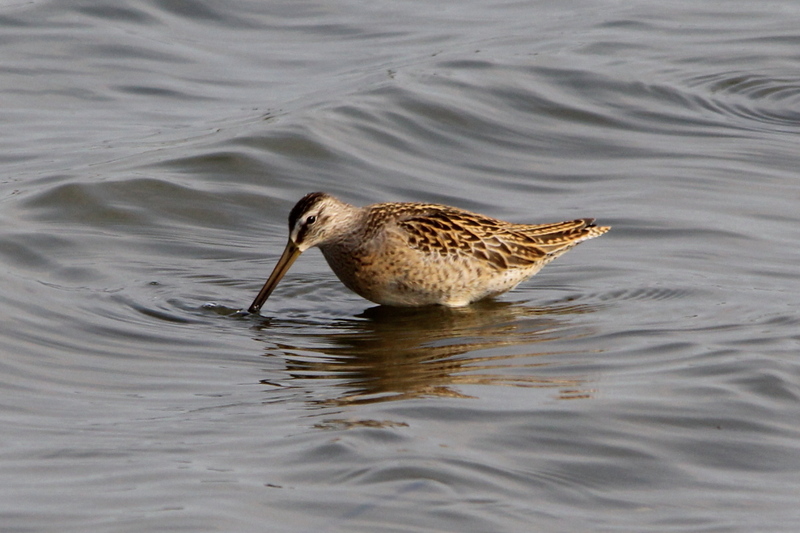 This bird is more likely to be seen near ocean coasts during migration than the Long-billed Dowitcher. 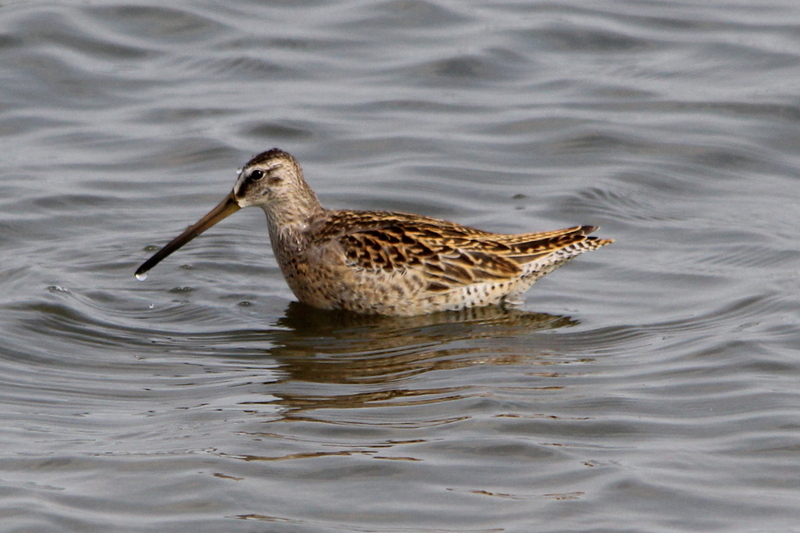 This species occurs in western Europe only as an extremely rare vagrant. This is number 128 in my photo life list, only 222 to go! This entry was posted on October 16, 2013 by quietsolopursuits. It was filed under Birds, Birds of Michigan, My life list, Nature, Photography and was tagged with Birds, Birds of Michigan, Michigan birds, Nature, Nature photography, Photography, Photos, Warblers. I like that second shot-it’s perfect. That particular pattern of brown reminds me a little of female duck’s camo. Nature must know what she’s doing! 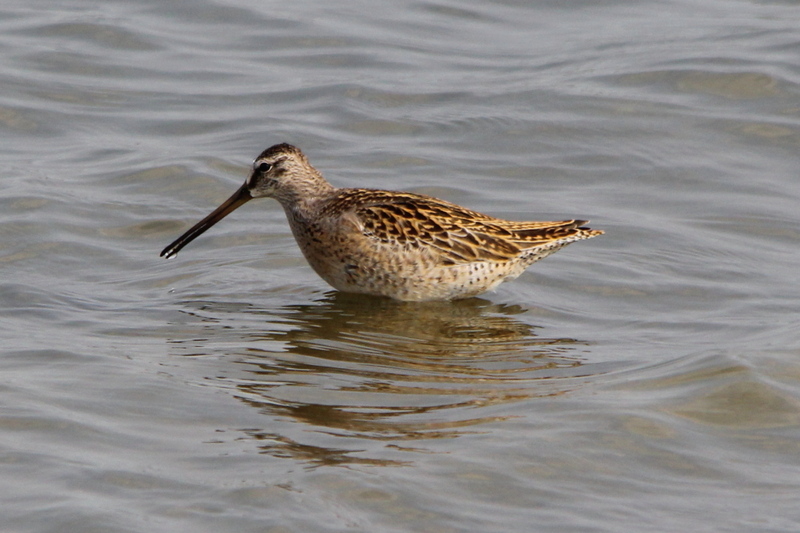 Apparently, that pattern of brown camo is very common among shorebirds and other waterfowl. Another fabulous bird post ! I need to find this on FB and share it. You have such wonderful photos of this charming bird. Thanks, I hide in the rocks with the spiders to get those shots. 😉 There may have been a snake or two also, but I didn’t look too hard in case there had been one, I didn’t want to know.